The worship of Green Tara is believed to help one in overcoming fears and anxieties. The Goddess Tara, a female Buddha and meditational deity, is the most popular goddess in the Buddhist pantheon. She is considered to be the goddess of universal compassion who represents virtuous and enlightened activity. The word Tara itself is derived from the root 'tri' (to cross), hence the implied meaning:' the one who enables living beings to cross the Ocean of Existence and Suffering'. Her compassion for living beings, her desire to save them from suffering, is said to be even stronger than a mother's love for her children. Green Tara is Tara's most dynamic manifestation, and she is often depicted in a posture of ease with right leg extended, signifying her readiness to spring into action. 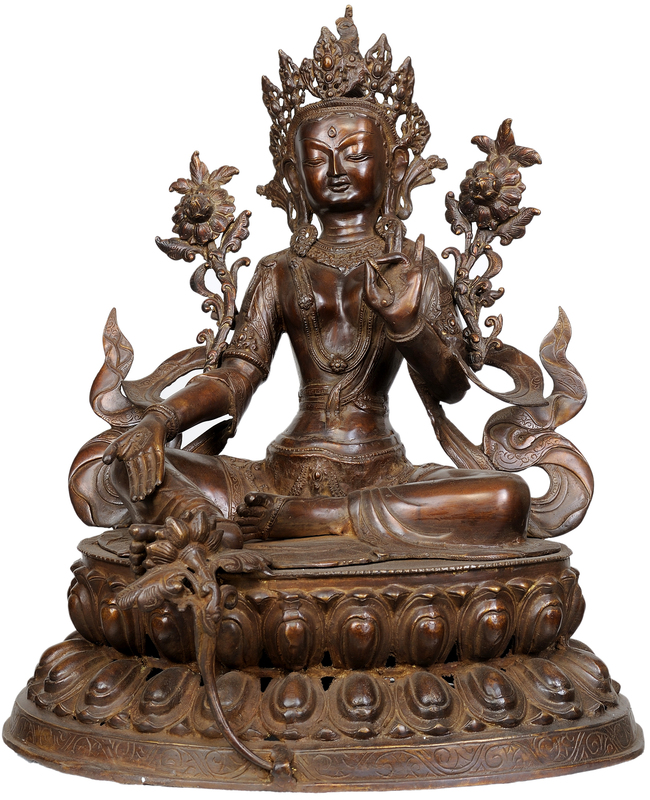 The left leg is folded in the contemplative position on the lotus pedestal, the two together thus symbolizing the integration of wisdom and action. Her left hand, in the gesture of granting refuge holds the stem of a lotus that floats over her left shoulder as a symbol of purity and power. With her right hand she makes the boon-granting gesture. The followers of Green Tara believe that her special powers will help overcome dangers, fears, and anxieties, and that she will grant wishes. She is also believed to help one cross over from danger to safety or from suffering to happiness. Her femininity imbues her with soft and compassionate feelings, and she acts very quickly and directly as a savioress. 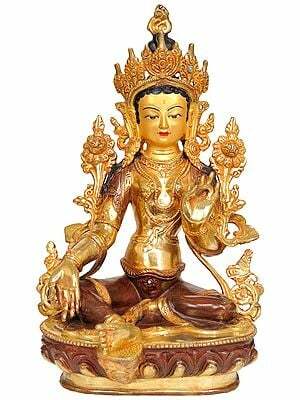 Representing active compassion, she is particularly worshipped for her ability to overcome the most difficult situations.